In a society filled with violence–from unpunished police officers to killings by mentally ill people with access to firearms–there’s also an epidemic of criminal assaults on workers at their job sites each year, which mostly will go unpunished, even unreported and unremarked, unless a perpetrator “goes postal” with a shooting spree. Workplace violence ranges from threats and curses to murder. Spitting on bus drivers is so common in New York City that their union won them DNA kits last year, to collect saliva. A study covering 7,169 emergency room nurses found that 43% had been verbally abused by a patient or visitor just in the previous week, one percent were physically abused, and 11% were both physically and verbally abused. For women, homicide is the leading cause of death on the job. 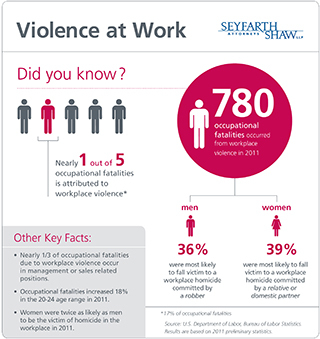 It is the fourth-highest cause of workplace death overall, with 463 workplace homicides in 2012. Even the normally terse Bureau of Labor Statistics remarks that “workplace violence can strike anywhere, anytime, and no one is immune.” Government agencies say that workplace violence is on the decline, but for certain categories of workers, it doesn’t feel that way. Two bus drivers’ unions held a conference in 2011 “responding to the recent massive increase in violence against transit operators.” The Department of Transportation held a summit on bus violence last year including unions, police chiefs, bus manufacturers, and agency heads. Asked if the problem were getting worse, President Larry Hanley of the Amalgamated Transit Union ticked off three incidents just in the previous couple of weeks: a driver slashed in the face, another held up at gunpoint, a woman driver punched in the breast. work at night or in high-crime areas. Of course, as at the psychiatric hospital, not all violence is caused by cutbacks. Patients, hotel guests, transit riders, bar patrons, students, airline passengers bring their own problems into the public sphere, from domestic disputes to lack of a job to mental illness to sexual entitlement. Managements have many motivations for turning a blind eye to workplace violence. One is cost. It isn’t that expensive to install a Plexiglas shield around a bus driver, but any cost is seen as too high when budgets are shrinking. A redesigned bus of a type sometimes seen in Europe, where the driver has an escape door on his or her left, is out of the question. Security guards, training in defusing volatile situations, personal alarm systems: all cost money that agencies are loathe to spend. But the biggest cost that management seeks to avoid is adequate staffing, which would boost safety two ways: better service and keeping employees from working alone. Karine Raymond, an emergency nurse in New York, says simply, “People get angry when there aren’t enough staff and their needs are not being met.” At Raymond’s Montefiore Weiler hospital, the Labor and Delivery department has been squeezing two mothers into a room meant for one. Some fathers act out. “They staff very, very leanly, they have ‘lean committees,’” Raymond said. “It’s all about skimpily and scantily.” Despite a union campaign that generated 128 “protests of assignment” with 852 signatures, management was not forthcoming about adding nurses, or security staff. Steve Schrag does health and safety work at another New York hospital. The biggest risk for attack is working alone, he says, “the same as for a bodega worker or a taxi driver.” Citing a Brooklyn case where a nurse was kicked in the head and left in a coma, Schrag said, “Another set of eyes and ears–if she hadn’t been alone, she would have been attacked but not as seriously.” Yet Schrag enters union discussions with management with the “presumption we won’t get full staffing, which would be the most important thing.” A hotel workers’ union staffer says she knows of no hotel where housekeepers clean rooms in pairs, even though that step would not seem to increase the number of workers needed. Management ignores violence in order to protect its institutional reputation, and individual managers want to look good to their superiors. Chicago teacher Jerry Skinner says administrators at his high school changed their procedures for reporting incidents, to produce a drop from 2900 to 1100. Also at stake is workplace control. Managements “don’t even want to have the discussion with the union,” says Schrag. “They don’t want to acknowledge that the union has a good idea”–an attitude rooted in the basic truth of employers’ attitude toward workers. Workers are left to deal not just with bosses’ on-the-job pressure to boost profits or adapt to straitened budgets. They’re left to pick up the pieces, even of their co-workers’ bodies, when pressures on human beings lead to an explosion. Jane Slaughter is a member of Solidarity and a longtime activist and writer in the labor movement. She recently retired as co-director of Labor Notes.